There is something special about Delhi. Her endurance, strengths and absorptive flexes made Delhi one of the oldest continuing heritage cities of the world. The tale of the royal city and her illustrious past underwent many phases, known and visible through its character and different names. Known in ancient times as Pandavas Capital Indraprastha, Purani Dilli during Prithviraj Chauhan’s rule, Mughal capital of Shahjahanabad, British Lutyens; Delhi has retained its identity over the past and evolved as a current modern cosmopolitan city of India. The center of power since time immemorial, Delhi is dotted with many historical traces of time including World Heritage Sites of Red Fort, Humayun Tomb and Qutub Minar, besides other cultural attractions. Qutub Minar - Qutub Minar is the surviving specimen of Delhi Sultanate. Built towards the end of twelfth century with the patron ship of Qutb-ud-din Aibak, the later storeys were added in by Iltutmish and certain alterations by Firoz Shah Tughlaq and Sikander Lodhi due to lightening. 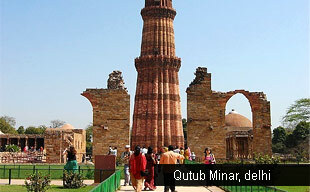 A recognized world heritage site, Qutub Minar is one of the most famous historical attractions of India. Fourth century Iron Pillar of Mauryan Dynasty; standing opposite of Qutub Minar is an excellent example of ancient Indian metallurgy and a famous attraction of this historical excursion. Humayun’s Tomb Humayun Tomb is one of the first mausoleums in India and the forerunner of the Taj Mahal in Agra. Built by Haji Begum, Emperor Humayun’s wife, this tomb was completed in 1569. Surrounded by four Persian gardens laid out in a proportionate form, this tomb features an artistic combination of red sandstone and white marble. It is inscribed as a World Heritage Site by UNESCO in the year 1993. Red Fort - Inspired by the architectural master of India, Shah Jahan; this red fortress witnessed the phase of Delhi where the city rose to prominence as Shahjahanabad, the emperor’s capital. Named as Red Fort because of the extensive use of red sandstone, this complex features a series of halls, palaces, pavilions and gardens. The famous structures of this fort include Diwan-i-Khas, Rang Mahal and Diwan-i-aam for the public proceedings are the noticeable buildings inside this heritage complex. Jama Masjid -Again a marvel built by Shah Jahan, this largest mosque of India was envisioned as a World-reflecting Mosque or Masjid Jahan Numa. Laid out in the year 1656, this mosque is a testament for king’s belief and an ode through his architectural excellence. The mosque can hold 25,000 people at one time. During Eid celebrations, the rhythmic prayers offered by thousands of devotees form the great attraction of Jama Masjid. On Friday, an Islamic holy day, the mosque comes into life with many devotees praying in front of the almighty. 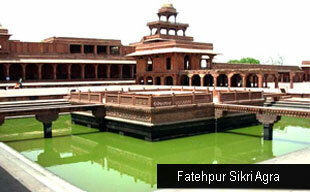 This largest mosque is one of the revered attractions of Delhi tour and India Pilgrimage Tour. Rashtrapati Bhawan - Rashtrapati Bhavan or Presidential House is the great structure and the official residence of Hon’ble President of India. The foundation of this erstwhile viceroy’s house was the beginning of Delhi’s new phase as Lutyens Delhi in 1912. 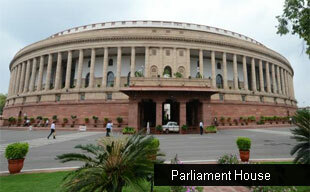 Parliament House Parliament House is the seat of supreme legislative body in India. Designed by Lutyens under Sir Herbert Baker, this circular structure consists of the two Houses, Lok Sabha (House of the People) and Rajya Sabha (Council of States) and President of India’s office. Bahai Lotus Temple - Shaped like the lotus flower, this extraordinary Lotus temple is a major highlight and the most visited monuments of a Delhi Tour. Located in South Delhi, this temple complex has nine surrounding ponds and 27 immaculate white-marble petals. This temple accommodates followers of all faiths and offers perfect grounds for praying and meditation in silence. The temple remains closed on Mondays. Raj Ghat -Raj Ghat is the resting place of Mahatma Gandhi, the Father of India. Located on the river Yamuna’s west banks, Raj Ghat is the place where Bapu was cremated on the evening of January 31, 1948. His last words ‘Hey Ram’ are etched on the black platform citing the site of his funeral. Hazrat Nizamuddin Dargah - Hazrat Nizamuddin Dargah contributes to the Islamic heritage of Delhi. It is actually a tomb dedicated to the Saint Sheikh Nizamuddin Aulia, one of the famous Sufi saints of the world. One of the most important Muslim Pilgrimage attractions of Delhi, this Dargah is best known for its spiritual connection through its Sufi Qawwalis and Urs – the death anniversaries of the saint. The tombs of poet and a courtier of Akbar, Amir Khusro and Mughal princess Jehan Ara Begum are also located within the Nizamuddin Dargah complex. Humayun Tomb is opposite of Nizamuddin Dargah and Inayat Khan’s tomb also holds close proximity to this shrine. India Gate -A reminiscent of World War I, India Gate is a war memorial commemorating the death of 70,000 Indian soldiers who died in the brutal warfare. A part of Lutyens Delhi, the construction of this gate was completed in 1931. Chandni Chowk - An oldest and largest market or bazaar in India, Chandni Chowk is one of the great ingredients for the seasoned heritage of Delhi. Strangely, the narrow alleys of this medieval market place haven’t changed much and still retain its legacy and old world charm. Current day attractions of Chandni Chowk include strolling around the bustling bazaars, relishing rich street food, sweets, exploring antique shops, quaint buildings, sensing the fragrance of exotic itras, etc. During a heritage walk of Chandni Chowk, don’t miss paying a visit to Gali Qasim Jaan, Ballimaran where one of the celebrated Urdu poets, Ghalib spent many years of his life. Tughlaqabad Another part of Delhi’s heritage can be experienced in its ruins at Tughlaqabad. Once the fortified city built by Ghiasuddin Tughlaq of Delhi Sultanate, this sub-city comprised of a number of buildings, palaces, mosques, tanks and towers surrounded by huge walls. Purana Qila The old fort of Delhi narrates another royal saga’s remnants. 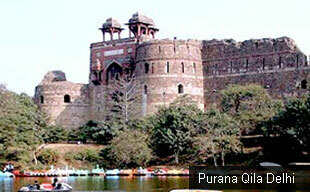 Purana Qila has seen the changing times closely. Constructed by the Humayun, the second Mughal emperor on the ancient site of Indraprastha, Pandavas capital, Purana Qila with its massive walls, three gateways and other structures still attracts tourists towards its quaint legacy and power struggles. Akshardham Temple- Located on the outskirts of Delhi, this majestically carved temple is a recent tourist attraction of this city. Inaugurated in 2005, this temple is dedicated to Hindu Swaminarayan sect, reflecting an amalgam of Orissan, Gujarati, Rajasthani, Mughal elements in its construction. Made of pink sandstone and white marble, this elaborate temple boasts of 20,000 carved deities. A light and sound show in this temple serves an additional attraction of the illustrious visit. Lakshmi Narayan Temple Lakshmi Narayan Temple or fondly called Birla Mandir is one of the pre-independence temples built by eminent industrialist B.D. Birla. The temple is dedicated to Goddess of Wealth, Devi Lakshmi along with her consort, Lord Vishnu or Narayan, the preserver. By Air – Delhi is the gateway city for tourists who are keen to explore north India in great detail. This capital of India is connected to all major cities in India and worldwide. The airport, known as Indira Gandhi International Airport is the second best airport ranked internationally, making it stand at par with the best airports in the world. By Train - With three railway stations, namely - New Delhi Railway Station, Delhi Junction - Old Delhi, Hazrat Nizamuddin; Delhi is connected to almost all major cities in India. By Road - Forming the base destination for Golden Triangle Tour, Delhi is a driver delight with excellent highway network offering accessibility to all major cities in the north, east and central India. Climate - Delhi’s semi arid climate makes the temperatures soar in summers and plunge in winters. Kingdom of Dreams – An Indian answer to Western Broadway, Kingdom of Dreams is India’s first live entertainment and leisure destination. If a tourist is spending some days in Delhi, then this magical joyride should not be missed at all. Combining all aesthetics of unparalleled entertainment in the form of musicals, dramas, themed scenarios, art and crafts, Kingdom of Dreams is an actualization of dreams and much more. The staged performances in the theatre combine world class state-of-the-art technologies, making it a surreal and fantastic experience. At Culture Gully, tourists can enjoy a colourful kaleidoscope of India's unique cultural diversity and can relish food at the themed restaurants. Agra – The heritage city tour of Agra is one of the prominent extensions from Delhi. Famed for Agra Fort, Fatehpur Sikri, Jama Masjid and immaculate Taj Mahal; the city is a must visit destination, even for a seasoned traveller. The indomitable spirit and purity of Taj invite most of the tourists to turn towards India and overwhelm themselves with enchanting surprises. Jaipur – The pink city of Jaipur is one of the fortressed bastions in Rajasthan. This royal capital is best known for its golden hued Amber Fort, Elephant Safaris, Hawa Mahal and other cultural attractions. Tourists can explore Jaipur along with Agra and of course Delhi under the most visited Golden Triangle Tour. Mathura – The sacred Mathura is the birthplace of Lord Krishna known colloquially as Braj-bhoomi. Dotted with many temples, the main attraction of Mathura is Keshav Dev Temple, built on the site of the prison where Lord Krishna was born. Shimla – One of the first hill stations of India, Shimla is a great excursion from Delhi Tour. This summer capital of British is still a great summer retreat, drawing many tourists in its cool solace.